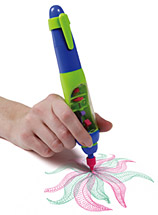 Spyro Gyro is an artistic motorized stylus that creates three different shapes (square, circles and triangles) in a seamless transition from small to big and back again. The harder you push down on the stylus, the smaller the shapes. Release the pressure and the shapes get bigger. Five different and interchangeable ink colors. One AA battery required (not included).